"I make, I am made." We sound out this mantra as we fold during our kriya this month. Nad yoga is the yoga of sound. It gets frequency into the places that our movement and even our breath cannot. Sounding as we fold helps to loosen the tension of our hips and hamstrings. But more importantly it is a declaration; clearing the way internally to say what we mean, to bring out what has been kept in. They release the stories that keep us from the lives we are ready and hungry to live. Speaking up and using our voice is a way of both expressing and protecting ourselves. This month we are in the root of ourselves; in the feet, legs, pelvic floor. This is the home of our sense of safety, our sense of inclusion - our place in our Tribe. The mantra is there to remind us of our voices, to cheer ourselves on, to keep our pace steady, to ward off those who would harm us, to speak up and share out our ideas and opinions. Our voices must be used and practiced just as our muscles are. This way our voices also gain dexterity, familiarity, and power. Our small human lives most resemble gods when we create. We create with our thoughts, with our words, with our sentiments. "HAR, HARE." "I make, I am made." Our words, said or unsaid - both equally powerful - make us who we are. Clearing our voices is as important as clearing the inner seams of our legs, building the strength at our core. As a result, we stand tall and speak clearly. What stories would you shake loose from your body? Consider this. Bring them to class in your mind and sound them out as we move. You may be surprised how effect this can be. Come try. Clear the way and see what can be built in its place. Keep practicing on these unfamiliar syllables. They will see you through (and see through you). Brene Brown defines "true belonging" as: "...the spiritual practice of believing in and belonging to yourself so deeply that you can share your most authentic self with the world and find sacredness in both being a part of something and standing alone in the wilderness. True belonging doesn't require you to changewho you are; it requires you to be who you are." This month, our practice gives us the physical capability of grounding ourselves, connecting with our legs, our feet, and our selves. Grounded, accepted, we can experience belonging. The meditation at the end of our practice is from the Vedanta tradition and is known as neti neti. It is a form of inner cleansing. We take the time to move our attention through the body and release any tension along the way. You hear me say, again and again, "The body is yours, but it is not you." Then we feel into the sensation of our weekday work, similarly releasing its tension, smoothing its texture in our minds. "Your work is yours, but it is not you." And then to our close relations, our loves, the responsibilities of our hearts. We soften and release the sensation of those roles with others. "They are your roles, but they are not you." And then to your opinions, your ambitions, your identity. "They are yours, but they are not you." The first time I was taught this meditation, I cried. I felt with a rush the first opportunity in years to set down motherhood, partnership, effort to build a future. It was unreal. I didn't know I was carrying so much, holding so much. Or what a sweet relief I'd feel in putting it down. Then hot on its heels was waves of guilt. How dare I stop mothering, even for a moment?! Didn't I care about my family? It was a tug of war. I wanted that quiet I'd found. I wanted the momentary freedom, but was it betrayal? I dared to persevere. I stayed in the practice. I dared to belong only to myself, to the Self I found in the center of the meditation; to the essence that remained. And surprisingly, when I returned to my body, my work, my roles, I was all the better for knowing myself as My Self. I was kinder, fuller, more patient because I wasn't aching for fulfillment that I couldn't articulate. I'd found a means of touching what I'd sought through food or ability or outer love. It wasn't betrayal at all. I belong to my Self and when I live fulfilled from that ground/foundation/center I can support far more than I imagined. Use this month's sequence to reset. To return. Find your way back in to what you need. 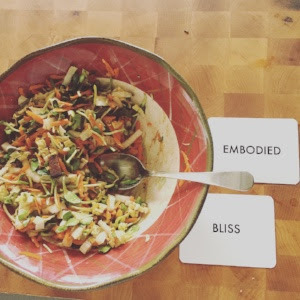 Take seven minutes at the end of class to rest in what we've made and let it help you to release what isn't needed and reconnect to what is vital. This is the work of the feet, the legs, the energy at our base. To hold us, to give us stability and daring to do what can be done. Our foundation lies inside. Come soon. I'll be there all March. I look forward to seeing you there. Full class schedules below. There are days that align; days that lift me and carry me easily aloft as they pass. And there are days that are the opposite; weighted somehow, heavy. And then the days - most of them really - that lie in between; neutral, malleable, a continuation of the yesterdays before them. These in-between days are really where most shift is possible. They are waiting for us to choose. They have a momentum of their own, but they can be influenced and given direction. The work is then to find the simplest, most direct practice to elevate the neutral, coasting moments. To do this, we need strength. Physical strength is an external demonstration of our inner efforts. Inner strength fuels inner thoughts and can be built and tuned just like outer muscles and dexterity. Step one is to take 3 minutes at the start of the day - can be combined with other things (showering, brewing tea, driving to work, walking the dog...) - but take 3 minutes and breathe in The Good. Bigger breaths. Taller spine. Heart high. Maybe a smile. Lift your gaze just lightly. Find beauty - a tree, a flower, the sky. Tune into a reminder of something larger, greater than your current state, and breathe it in. The first 10 seconds are easy perhaps, like most exercises. But we practice to sustain it. To build stamina in our ability to expand, to smile, to expand. To let that momentary elevation take root in our blood and our brain chemistry. Step two is to begin to give our strength dexterity. To shape it towards who or what needs elevation in our lives. I've looked back at days recently where everything that needed doing was done. Where everything I'd wished to accomplish or read or sweat out or hold had happened. Similar days of great promise lay ahead of me. So why wasn't I singing with joy? Habit. Sheer, steady, implacable habit. There have been long, long days of struggle to get to today, to now, to this. And that struggle has become engrained in my posture, my expression, my emotions. The skill I need now is to breathe it in. To see it, embrace it, and lay claim to where I am Right (blessed) Now. The emotional stamina to maintain my joy is all that is needed. It is as simple as an undeveloped muscle. It can be trained. It can come more and more easily with each repetition and it can start to hold me up even when I'm not trying. We do our physical yoga practice to feel our own relationship with our bodies renewed. We are stretched out, reconnected, reunited, and stronger for it. Each time we go we don't just gain physical prowess, we also had to overcome all the resistance, all the excuses, all the reasons we may have had at first to not showing up for ourselves. But little at a time we overcame our own reluctance and we built a practice that was consistent enough to stand down all the other whispers and whines to stay in bed another few minutes and leave the mat for tomorrow. So too, I am learning to lean into the Good I can find in my breath. That with practice it isn't at all about what I've done well or not in that day, but rather it is the simple practice of feeling the sensation of Good - of being alive, of my ability to love and be loved, to be aware of it all - and this can grow. It resembles brushing your teeth: a simple moment of mental and emotional hygiene, 3 minutes a day (or more if you are daring!) and you can start to brush loose the plaque that may harden on your heart during tough times such that you can't remember the last time you really let loose and turned on the high-beams, eyes bright and mouth wide. Smile. Shine. You are an extension of the Great Good in the world. This is my mama. I miss her so. At 85 years old she has returned to Southern Africa where we lived for many years and is visiting my oldest sister and her family there. She is sending photos of dinners and Cape Town and local friends. Amazing. But I miss her. And as I walked today I thought of what it is that I miss: her presence, her company, her listening. She always had time for me. She was there. I think of how Lily waited for me to see the picture she'd made as I finished an Instagram post this morning, as I scrolled through my email, scrambling to tuck a few responses into my outbox before we left the house. Was I there for her? I read, study, practice, listen, learn, teach nearly incessantly. Mostly for the joy of it. I am always aware of the wonder of my work and the privilege that is mine in what I get to do each day. But recently I've become aware of a relentlessness of what Needs To Be Done. The posts, the marketing, the books waiting beside my desk, the training I'm participating in... And I return to the thought of my mom. I love her for who she is, who she was with me, not what she'd read or practiced. Just her. I know she modeled self-reflection and journaling and deep devotion to wonder and prayer. I know she had a practice, but it was subtle and spacious enough that I know her company with me first and foremost. It didn't get between us. it was skillful and she used it through thick and thin and it taught me to do the same, but it never seemed she was doing it to achieve something or heal a sense of unworthiness. My goal of late is a starting point of 2 hours each waking day with the phone turned off. More focus. Fewer distractions. Fewer, simpler tasks, and more time. One hour to read each night beside my kids. Doing less now to make more in the long run. With that in mind I have to tell you, my 100 hour training Power of Prana is rescheduled to begin Fall 2018. [Sept 14,15,16 || Oct 5,6,7 || Oct 26,27,28 || Nov 16,17,18] Should you choose to join me for those astonishing 100 hours, they will be all the better for the delay, for the quiet I am crafting in my days. Also, in my weekly classes, I will be offering 60/70 minutes of asana, then 10 minutes of rest and savasana, and 10 minutes of guided meditation. We need guidance on how to start to savor ourselves at rest more fully. This is at the heart of yoga practice but we have to choose to make them the heart of what we do. Please join me. Yoga is "the intimacy with ourselves that remains when the chatter of our thoughts falls away." (Michael Stone's translation has always moved me.) This intimacy heals, holds, remembers, and restores us as nothing else can. I look forward to that time together. What unimaginable choice can you make that makes for quiet and space and generosity in your company? I believe in you. ps. this newsletter was written in a little notebook with a dull pencil while sitting on a rock overlooking the river valley. can you hear the water going by? I thought I’d understood this, but the past 10 days have shown me there is much more to what I eat than I realized. Due to some reading I’d done recently I chose to eat mostly leafy greens for 21 days. Once a day, I have cooked vegetables or maybe some soup, some nuts and seeds, but otherwise everything I've had is fresh and green. My most important experience so far is that I realized I am eating sunlight. Or as close to sunlight as a human can get. Just the plant converting light to chlorophyll and cellulose. Nothing in between. No processing, no addition or subtraction. Sunlight. And I’ve eaten it up. I became this light. I felt it. Thought with it. Made of light, with less and less in the way. Then, having this revelation, I started to notice a craving for my past, known self. As if this was a grand bright, light trip, but where was the comfort of my dark, heavy, inertia that felt like home? I often teach “Don’t go back. Don’t go back to the way you came.” We work and move and breathe and pray and find such light in our souls during our practice. Then we stop and are tempted - oh so tempted - to slowly sink back into the weight of our previous ways. Our heart falls a bit, our head dips down, our spine slumps and our sense of our ordinary, everyday limitations returns. Somehow it feels like home. Instead, build the muscle of light with me. Build the light and then stay - as long as you can, as much as you like, but savour it. Stay elevated. Tony Robbins teaches that we are addicted to our problems. We respect them, polish them, share them, spend our money and time to respond to them. I can feel now, with this ‘food as light’ experience, that I’m ready to invest in my light. To revel in it, explore it, share it out, and make more. Consider your neutral state. This neutrality can shift. You can have a higher frequency. Keep exploring. Sensations of deep gratitude, compassion, and joy elevate our brainwaves and the electromagnetism of our hearts. When you cultivate those sensations, you shift your state. You feel your frequency change. Then tune in to the choices of your day that support that state. Keep refining. Choice by choice. Notice when you want to go back. That’s okay too. But know its a choice. You can keep it or change it. We are more malleable than we know. Oil blend this month is always available at the front of class for you to try and to use. If you would like to buy your own blend, let me know I always make extra. $10 for 10 ml roller bottle. Grapefruit, bergamot, ylang ylang. The oils continue that emboldened state even after we are off our mat. Imagine being able to roll your practice on at a moment’s notice. Pretty great. Open House for the Power of Prana spring 2018 training is SUNDAY FEB 18, 9:30 am at Federal Hill. Right after our Sunday morning class. Bring a friend, come ask questions, get some details that might make all the difference. If you can’t get there in person, there will be a FaceBook Live video on FRIDAY FEB 23 NOON. You can watch live and type in questions. Or you can watch the recording later. There is one there already from a FB Live of last friday. Take a look if you like. Would love to have you there! This week started my Wanderlust workshop. A chance to get personal with the wider, older teachings of yoga. This first week we introduced the 8-fold path of yoga, and in particular the YAMAS and the NIYAMAS. The ethical precepts. How to live with respect and contribution to the outer world, how to cultivate your inner world. After explaining each one, we each chose the one most needed, most relevant to what we would shift in our lives. The people in that room are the best teachers I have. Honest and true and willing to share their insights and practice. Here’s the trick of it… SANTOSA is the niyama often translated as contentment. A needed aspiration for most of us. But what I’ve learned from years with the Yoga Sutras in my life is that wanting to foster one niyama in our lives - contentment, for example - usually means there is work and practice to be done in another. In this case I can feel that APARIGRAHA is the one for me to practice to truly experience contentment. APARIGRAHA is translated as nonhoarding. The reminder that we don’t need to keep things to ourselves. That holding on with greed and fear doesn’t serve us, and more importantly doesn’t serve the community overall. It is the kindergarten instruction of “share with others.” Don’t block the flow. There are three primary fears: the fear of less, the fear of loss, the fear of never. We hoard and hold and keep in a false attempt to beat back those fears. The lesson and the blessing of aparigraha is that of current / conduit / vessel / flow. We are here to be moved and to be moved through. I can feel how complete I already am. I can feel that the next training isn’t going to fill me more. I can feel that keeping and not using my perfume isn’t going to make it last longer. Everything decays and leaves. I will waste it. I will miss out. At a cellular, molecular, structural level. Letting go. Not grabbing. Not keeping. Not holding. Instead, engaging. Sharing. Listening without acting. A vessel. A current. This is the path to SANTOSA. To contentment. My strength is in my choices. So I keep listening to what motivates my choices. Keep making choices of flow and current. Keep learning to feel it in my body. deeply. Where is this false hunger, this dissatisfaction? What is its texture? Where is its tension? I take the time to feel my inner landscape and how the fear of less, loss, and never reside in me. 30 min of stillness and attention this morning. I was guided and it was slow going. But I can feel it. I can know myself. I can feel what lies beneath. You are oh-so-invited to come and join us on Saturday afternoons from noon-3pm at Federal Hill for more of the Wanderlust workshop. Register here for week 2. Or you can get your own copy of Wanderlust by Jeff Krasno and dive in on your own. Or just start from here, from these words and choose a yama or niyama of your own and for 30 days make an effort to listen to what it has to share. Listen to all it offers. Be willing to let it in. To be what you long for. The year is advancing quickly to its close. Without hurrying, I am basking in each last moment 2017 will offer me. It seems to accelerate as 2018 comes closer. But I have taken a few days of late to reflect back on my year and make adjustments for what I will call in in the months to come. Three things stand out to me as I reflect on the year. 1. This year I settled into my meditation practice like never before and it changed everything. It held everything. I learned of an inner landscape of my very intimate own that I had not found access to before. I will keep this in my mornings. I will add this to my teachings. I will help, as I can, to share this as a regular part of each yoga offering. I am thrilled with the feeling of waking with the pleasure of sitting in my own still company each morning - whether I am grumpy, tired, ordered, or not - I am wholly present and this changes it all. 2. My food became more and more plant-based (credit to the Rich Roll Podcast) Week after week I listened to different people extoll the merits of eating a plant based diet for personal reasons, for ethical reasons, for reasons of their heart health and brain health, for fitness performance and improved recovery and overall wellness, for land-use and carbon emissions reasons, for the judicious protection of antibiotics for medicinal purposes for all beings. The list goes on and on. But the real testament was in how I felt better in my own life, in my own body, as a result of eating plant-based. I'm not vehement in my food choices. I'm not vegan or vegetarian. I'm a human being that needs to eat to live and want to do both of those with as much grace and intention as possible. So I eat mostly plants. And for the first time since being a teenager with eating issues, I am at peace with my body. 3. 2018 will be the year of more connection for me. I've set time aside each week to write to friends. Have a calendar of dinners with people to come each week. This past year, I became focused with that which is necessary and good, but it left me edgy and hungry to return to the company of those I love. So I've made it a priority and am happily willing to help with their work, to watch their kids, to meet them at the grocery, to let the busy circles of our lives overlap somehow so we feel heard and known and loved and enjoyed. Part of this connection is a more direct connection to the state of the world. We are so many people on the planet now. Recent politics leave me confused and cranky and wanting to withdraw. I watched Al Gore's An Inconvenient Sequeland a week later the movie, Gandhi. The overlap for me was Gandhi's homespun movement where the Indian's boycotted Brittish-made cloth opting instead to make their own and Al Gore's training seminars to support motivated citizens to know the facts and motivate/mobilize their communities in appropriate ways. Both were acts of positive planet-changing learning, sharing, intelligence, and action. What is my version of making my own cloth? I can't make all of what I wear, and there is more than enough to go around currently. But I can make an effort to buy used all this year. To buy used books [Amazon makes this incredibly easy], to buy used clothes, to swap with friends, to use eBay - to reduce my use of starting with new resources to make new goods that already exist. I can have a lighter, more meaningful footprint. My plant-based choices are a part of this. My meditation is a part of this. Self-care and consistent sleep patterns are a part of my contribution to every moment I am a part of. It all matters. I will listen to how this feeds into my own teachings at a day to day level. I know for certain that the more I do of Kundalini yoga, the more comfortable I feel in discomfort; the more humor I can find in my own actions and my own reactions; the more power I find in my will and my determination to be a source of light and generosity with what I know and with what I have and with what/how I consume. Such a grand practice currently and I know there will be more. There will be something that takes my yoga to the World more fully, more directly. I can't see it yet, but I am making myself available to whatever source could use what I have to offer for the greater and greatest good. I will keep contact with you as it forms. Reflect on your year: What will you leave behind? What will you increase? Name three things of each. Physically attach that list where you will encounter it. These are actions of power. You are so beautifully potent. Monday Jan 1, 2018 Federal Hill 6:15-8:15pm Kundalini by Candlelight - space is running out. Please book ahead online. I fear we may have to turn people away at the door. Claim your space! WANDERLUST book group starts Saturday January 13, 2018 noon-3pm and runs for 8 Saturdays. A chance to learn more about the history and breadth of modern day yoga. Lecture, physical practice, guided journaling, discussion, and a primer for breath and meditation practice will all be included. Get your book and book your place. Details here. You can sign up for all of them, or pick and choose. My 100 hour training for teachers and students alike The Power of Prana will be in 4 weekends this spring starting in March with slight changes to the schedule to send you home earlier and with a spring still in your step on Saturdays and Sundays. Details, description, and dates are here. You can sign up for all of them, or pick and choose. Each month I record our kundalini sequence at home and post it on YouTubeat the start of the month for you to do at home. Always there. You are always welcome to reach back into past months and use your favorites over and over. **New offering: ** Each 40 Day Practice is a combination of 30 minutes of asana, 20 minutes of kundalini kriya, 10 minute guided breath practice, and 10 minute guided meditation, all designed to foster a specific state of mind/body. Rise, Focus, and Return all offer movement, stillness, and guidance to build consistency and breadth in your yoga practice.They are designed to help you build a practice for 40 days. They help you to build consistency. But you can take as much time as you like. Each has a printout that helps you to track your progress, helps you get back at it when you lose your way, helps you see it successfully to the finish. Take a look. Once you buy the practice you have lifetime access anywhere, anytime. $40 for 40 days. Enjoy. It is the time of year for giving gifts. Most of us have our physical needs met which means it can be challenging to give a meaningful gift (and if you are reading this it is likely that meaning matters to you). Give an INVITATION. Meet up with a friend for a walk or a bike ride. Go to an art gallery, a new restaurant, the grocery store. But invite them to share time together. Recently a friend told me that all she wanted for Christmas was more time with me. So I invited her to walk and we walked and talked and reconnected and at the end we set the next two times we would meet for more of the same. Her request for more time really touched me and she was grateful for my making time. It was a gift to both of us. Give SOLITUDE to caregivers. New moms in particular need time to care for themselves. Time for a shower, a book, an errand, or a workout can be truly medicinal. Give those who spend their days caring for others the chance to care for themselves by stepping into their role for an hour or three. Even better, give CONSISTENCY - a recurring day that they can look forward to and make plans to use. Sometimes it isn't that we don't want to ask for help, it's that we want to do it ourselves and we just need help to make that possible. Friday‘shower hour’ when my kids were toddlers and a friend came by to watch them saved me for sure. Give COMPANY - In person, on the phone, on FaceTime, there are many ways to connect and keep company. I know that I do much better with someone sitting and talking to me even as I wash the floor or sort my files. In the past I have asked a very organized friend to come over and help me turn my kitchen inside out and put back into new, amazing order that I could never achieve alone. What is your skill? What do you have to offer? How can what comes easily to you be easily shared with someone else? I sorted through 5 years of paperwork and bills while my mom sat on the floor next to me and read a book. I couldn’t have done it without her company. Give RECOMMENDATIONS - booklists of your top 10 reads of the year, cookbooks, movies, restaurants, destinations, or documentaries. When my sister turned 50 she had a French-themed dinner party. My gift was 50 songs as a soundtrack to the evening; we moved from appetizers to dinner to the conversation afterwards all with a lush French theme. Make playlists of music or videos or even podcasts. There is so much to choose from that a curated version can turn into a great gift. And to you I offer my favorite cookbooks of the year: The First Mess and My New Roots - both modern takes on vegetarian meals and snacks. My favourite podcasts were "Where Shall We Begin?" by Esther Perel and the Rich Roll podcast. You can check them both out on iTunes and feel free to send me your favorites as well. Have a healthy, creative holiday and know that you are the best gift that friends and family could hope for. Keep it simple. Take care of yourself. Crystal Crisp will sub for me on Wednesday 12/27 at Midtown 7:30-8:30pm. On Monday 12/25, Christmas Day, I will not be teaching, but Crystal will offer a class at noon at Fells. January 1, 2018 - Kundalini by Candlelight 6-8pm Federal Hill is an annual chance to start the year with clarity and light. We practice only by candlelight and the first half is to release 2017 and the second half is to invite 2018 with a creative, curated intermission. Look forward to seeing you there! Register here. Wanderlust book group At Federal Hill, noon-3pm for 8 Saturdays in a row starts Jan 13, 2018. This is a workshop to give you an overview of the ancient history and philosophy of yoga as well as the modern application and interpretation of its practice. We will have lecture, discussion, writing, asana practice, and the last 30 minutes of each week we will establish and develop a breath and meditation practice. This is such an outstanding chance to expand your understanding of yoga. Suitable for beginners and advanced alike. Come for all of them or pick and choose. Find all the details here. Register here. I realize I just wrote to you about how I had to pause the 40 day practice project this morning. But God bless Donna Naslund for being the first to head right in and buy herself a copy. Thank you. Jordan Block did heroic work designing the pages, cajoling me when I thought it was impossible, and solving it all behind the scenes. I had no idea it was about to come together as it did. So please - feel free to take a look. To buy one. To buy all three. Focus in or mix and match. 40 days for $40. But they never expire. Yours to keep. RISE. FOCUS. RETURN. This is where we start. The idea was to give you tools to choose from so that every day you could decide if you wanted to do vinyasa, kundalini, breath, or meditation or any combination of these. Whatever you choose it will create consistency in your energy. You have 4 options with which to meet each day, again and again, 40 times over. A forty day practice of anything will affect your life. And these forty day practices will ideally be what creates an experience of the power of consistency. As well as the support I provide in the sequence instruction and the printable pdf that goes with each practice. That said, if your forty days has some gaps in it, persevere. It all matters. Keep at it. Send me questions. Tell me when you are stuck. Tell me how it can be improved. Tell me what other topics you would like me to provide in the next round of three and we will keep building the library for you. I am smiling. Such things. I made you something. I made you a practice. Actually, I made you three. 3 asana practices for when moving serves you. 3 kundalini practices for when you need to shift or restart your energy. 3 breath practices and 3 meditations to settle and for your mind. The trick is to get them to you. To get it finished and online and easy for you to access was harder than I'd imagined. Squeezing the work into days already full of teaching and learning was painful. It started to erode the quality of the training to come this weekend. I became cranky with my kids, hurried in my activities, my energy and interest felt flat and tight. I simply didn't enjoy my own sweet company the way really love to. So I had stop. to pause. To have the scary, painful, conversation I'd pushed aside and labeled failure because I'd thought we could pull it off. In my 100 hour training we spend time every weekend talking and writing and considering, "How do I feel?" This is the foundation of our choices. Do I feel lonely? If so, no amount of food will feed my spirit - even though I've tried often to fill my heart with food. Do I feel tired? Then doubling down on my exercise and effort won't chase fatigue away. When we come to really know how we feel, we can decide if that's how we want to feel and direct our energies towards true fulfillment. I want to feel strong and whole and generous. That means I need more time in my day, in my week, in each project. I'll get it to you. I'll tell you when it's ready (soon, so soon). I'm thrilled to share it with you. Just need a moment. In the meantime, take this lesson and think for yourself – "How do I want to feel?" What do I desire? Give yourself permission to make the change that's needed to feel whole. I give you this lesson; the daring, the vulnerability of trying but not quite making it as planned. I give you the model of someone giving themselves permission publicly to pause. To breathe. To make progress in a way that heals all their relations. This is the power of my prana: The courage to listen, to feel, to respond, to speak. So I can be sound and whole and peaceful - SVASTA: centered in my self. Come share a weekend with me to know more. New spring dates for the training are below. Choose one weekend or all of them. Or maybe I look forward to your absence even more, as you take the time to be exactly where you need to be. Class schedule I will be away Sunday December 17 for the 8-9am kundalini class. Crystal Crisp will stand in my place. Keep coming to your practice whoever is leading you. I'll be back for all other December Sundays. Kundalini By Candlelight is January 1 6-8pm. If you can't find it on the schedule, keep in mind it is a workshop, not a class, located at Federal Hill. Or you can register right here. Wanderlust book group starts Saturday January 13 noon - 3pm at Federal Hill and meets for 8 Saturdays. We work our way through the 8 chapters of the book compiled by the people who founded the international Wanderlust yoga festivals. We cover philosophy, history, lineage, and modern yoga perspectives. We practice. We have time to write and reflect. We will also have the last 30 minutes of each Saturday devoted to building and establishing your meditation practice. Useful for total beginners and avid practitioners. Register here for all or one weekend. Full descriptions of the particulars of each weekend will be up on my weekend schedule by next week. Spring 2018 Power of Prana is now 4 weekends! A little more space in the schedule gives us more time to cover what previous trainings have covered more thoroughly and with less student fatigue. I want to keep improving what I offer, informed by each experience. Check out descriptions of each weekend and the full dates here.